Karpo is the Greek goddess of the fruits of the earth, and its namesake restaurant in the Megaro Hotel pays tribute to this fact by compiling a menu that relies on seasonable and sustainable ingredients. An all day bistro, the composition of the dishes draws on an eclectic mix of influences. There’s the touch of the Italian with offerings such as burrata, blood orange and puntarella, but there’s also a sprinkling of the Americana with the likes of Southern fried quail. Situated across the road from King’s Cross Station, it’s not located in the most auspicious location. Nor did the eco/urban design of the restaurant feel particularly trendy, with the mix of concrete, wood flooring and an eco wall hung with a stretch of plants being rather unconventional. Karpo didn’t generate a great sense of warmth for me when I first walked in, but one bite of the food and I was sold. A starter of Cornish scallops (£10) was delicious, although less cooking time would have given it a more opaque centre. Accompaniments of chargrilled leeks were tasty and a potato purée was wonderfully creamy, both of which worked well with the scallops. But the most winning aspect of this dish was the fantastic stock reduction finished with balsamic vinegar that gave the sauce both depth, intensity and sweetness. 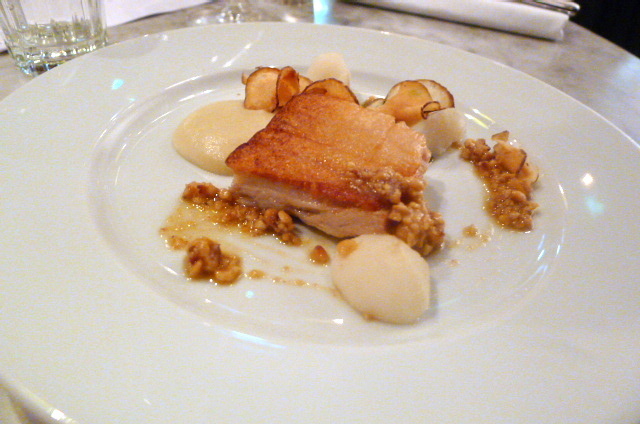 Pork belly (£6) was lusciously moist and tasty although the skin was soft and did not crackle. If it did, this dish would have been just about perfect. Nevertheless, it was really, really good. 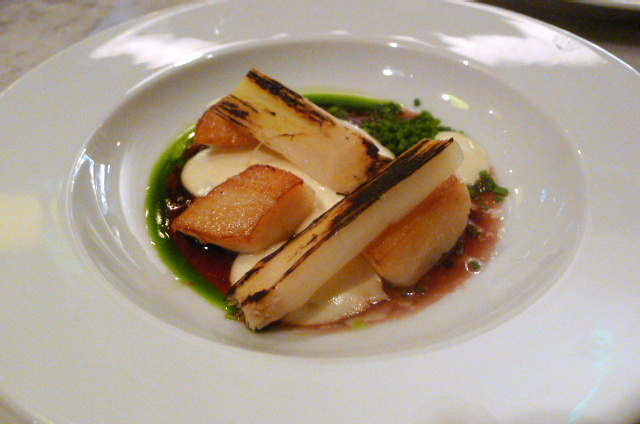 It came with Jerusalem artichokes served three ways – puréed, as crisps and pickled. As such it provided oodles of contrasting textures and flavours. Finally a hazelnut pesto rounded off this lovely and reasonably priced £6 dish. A herb crusted loin of lamb (£16), cooked medium rare, was superb, incredibly tender and juicy. 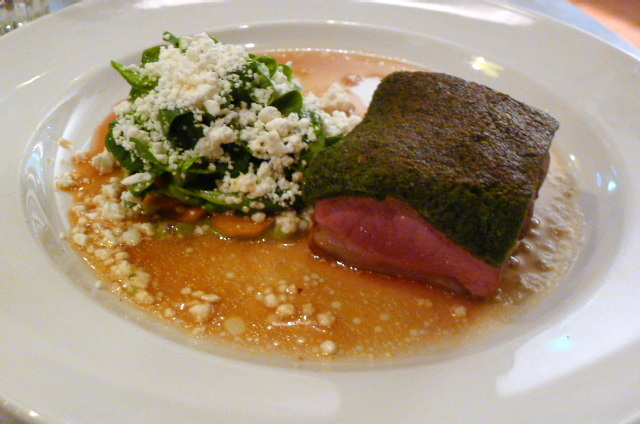 A side of watercress, gently picked carrots and sheep’s cheese proved interesting. It was resoundingly creamy from the cheese and tangy from the carrots, and it worked really well with the lamb by providing lots of contrasting depths and flavours to the meat. 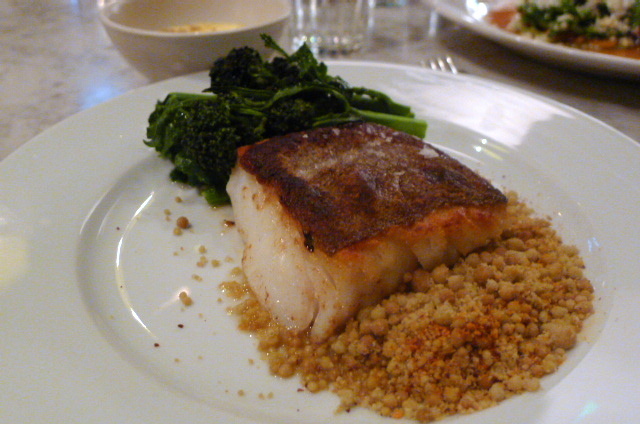 Roast cod (£15), sprouting broccoli and hollandaise (which I asked to be served on the side) were all nicely done. But it was the fennel sand that proved to be the most interesting aspect of this dish. Made from fennel seeds and crushed almonds blended together and roasted, there was a nutty, earthy sweetness to the sand. It worked a magic on the fish and the creamy, tangy hollandaise. 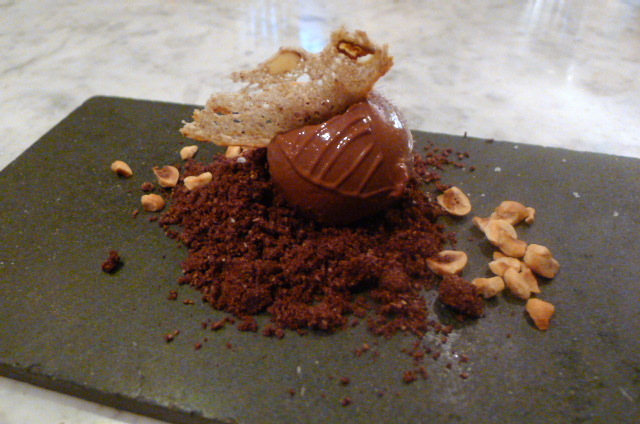 A bitter chocolate mousse with hazelnuts (£5) was really yummy, although a dollop of crème fraîche would have helped cut some of the richness. On the bottom was a bed of chocolate sand made with sugar, flour and sea salt which was very fine in texture, moreish and good. The sprinkling of sea salt worked to great effect in the dessert. 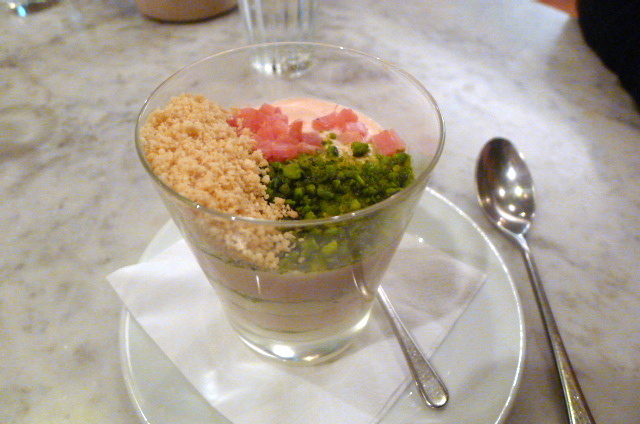 A rhubarb fool (£4.50) layered with cream, pistachio crumbs, and topped with finely chopped pistachios, rhubarb and shortbread crumbs, was wonderful. It was an enlightened blend of creamy, sweet, slightly sour and nutty flavours, all well balanced and merging deliciously together. Karpo was a surprising find. It was hard to believe that beneath the unusual façade and décor was a restaurant capable of producing such a wonderful meal. And the prices – so reasonable too! I didn’t connect with the vibe when I first walked in to Karpo, but after a few delicious bites, that was all easily forgotten. With its reasonably priced menu, great food and charming effusive service, Karpo is well worth a visit. Price range: £24 to £32 for three courses. Excludes drinks and service.